Haeundae Pobi Guesthouse i Busan, Sydkorea: Reservér nu! Our goal is to provide you with a friendly and pleasant experience in a clean and safe environment where people may socialize comfortably. 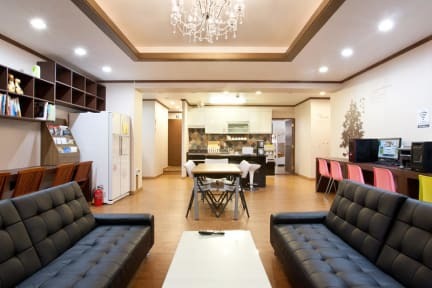 Pobi Hostel is a beautiful guesthouse located within easy walking distance of famous Haeundae beach, Dalmaji Hill (Moontan Road), Dongbaek Island, and Apec Nuri Park (Nurimaru). There are also many Korean restaurants and other tourist attractions near Pobi Guesthouse. Guests can entertain themselves with free Internet on any of our 3 computers, or use the Wi-Fi available in our beautiful common area. A big kitchen, completely equipped where you can cook your meals quietly. Bathrooms that are large and clean. Pobi Guesthouse is comprised of two separate sections. Large groups may be able to book own private section. We have lovely cat Pobi in Part A, if you have any problem with that please let us know. You can stay in no cat area.